Guo Pei Haute Couture Spring Summer 2019. From the Goddess Chang’e in the Moon Palace to the fairies in the Dragon Palace, the alluring and romantic mythology of the East boasts a long history. In the folklores of the East, a palace was not only home to the royal family, it was also the spiritual resting place for those who had cultivated and attained Tao, or underlying natural order of the Universe. In Chinese, the word gong (meaning, palace) is both a symbol of supreme power and a synonym for the queen. The palace is both a paradise on earth and a habitat for gods. For 5,000 years of Chinese history, the palace had been the stage of timeless legends and scores of human dramas. 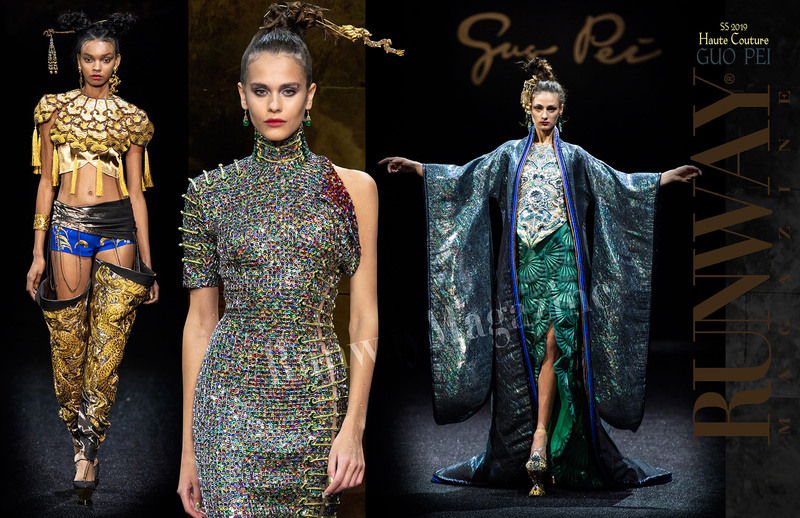 For her Spring Summer 2019 couture show in Paris, Guo Pei will recount the stories of “East Palace”, using the finest of traditional Chinese craftsmanship incorporated with Western stylistic elements and contemporary technical innovation. 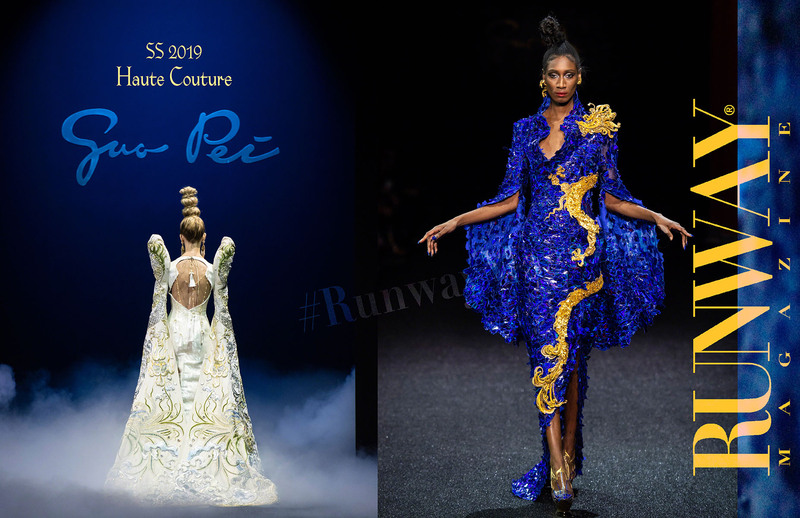 Guo Pei presents her Spring Summer 2019 Haute Couture collection in Paris at Palais de Tokyo, itself a palace of modern art. A rendition of the Hall of Supreme Harmony in Beijing’s Forbidden City, the dramatic and majestic recreation of the red columns within the Hall, are the backdrop for the show in Paris. This visual effect draws inspiration from the myths of the East, the red columns a metaphor for Heaven and Earth connected through celestial pillars. Palais de Tokyo will be transformed into a magnificent and elegant East Palace, gleaming in imperial grandeur and Taoist mystery. 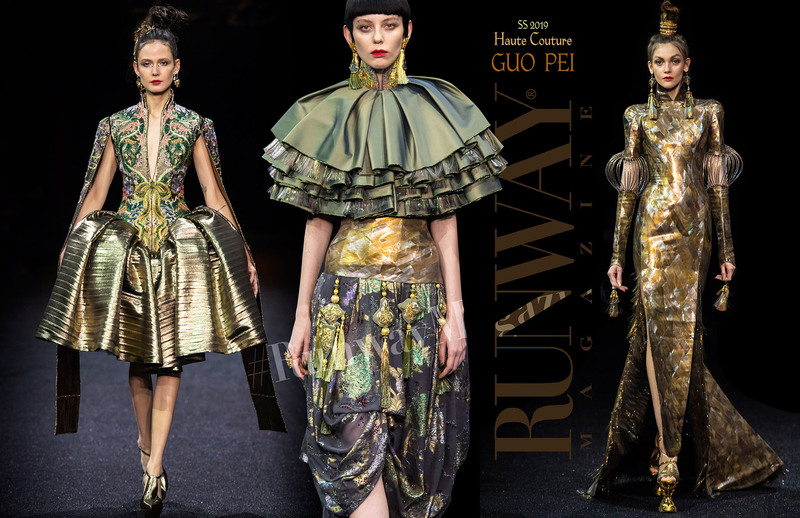 In this collection, Guo Pei expresses Eastern cultural elements through Western textiles: will woven with colorful metallic patent leather, mosaic-style sequins and prints. Highly textured fabrics bring to life the appeal of dazzling contemporary styles, while fabrics in free-flowing sky blue color or the sun-like pure gold reflects the vitality of nature. Another highlight of the show is the art of mother-of-pearl inlay from Japan. The method was originally derived from a technique used in Tang Dynasty (618-907 AD) in China as a substitute for gold and silver foil silk. The artisans grinded mother-of-pearl to blanks of 0.1-0.2 mm each in thickness, and then cut them into threads to be woven into silk fabric. The production process requires undivided attention to the last detail, in order to perfectly integrate the seductive iridescence of mother-of-pearl into the silk brocade and recreate the magical opulence of the East Palace. 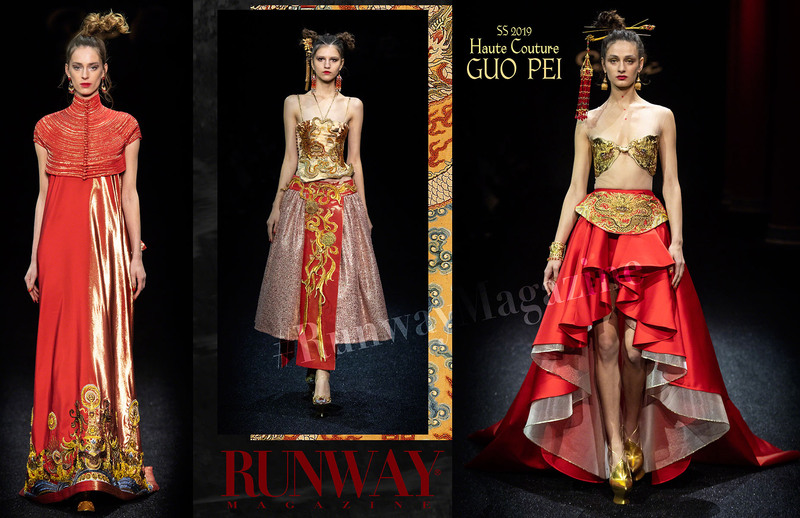 In her nearly 30 years of design career, Guo Pei has been committed to celebrating Eastern aesthetics. Unsurprisingly, dragons remain one of the most important motifs in this collection. Taking on the slender form imagined in the Han Dynasty (206 BC – 220 AD), known for their power of metamorphoses, the five colors of the dragons–black, green, gold, silver and red—allude to the ancient Chinese philosophy of Five Elements and Yin/Yang. 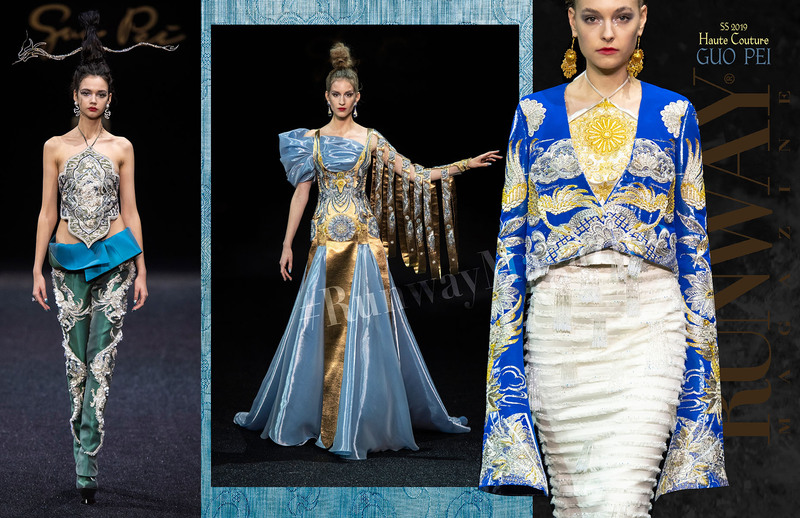 The designer also draws inspiration from ancient iconography, summons all the auspicious animals from Eastern folklores and recreates them as symbols of the future, blurring the boundary between human sphere and mythological realm. Since ancient times, court art has represented the highest standard, as the imperial court was able to command the services of the best craftsmen. Drawing from the embroidery techniques perfected by generations of the traditional court artisans, the designer also brings in different embroidery techniques such as gold-wiring, net-shaped embroidery and 3D padded embroidery to deliver refreshing, modern effects. Most of the shoes are made of same fabric used for the garments, which incorporates mother-of-pearl inlays and embroidery details. The imperial dragon patterns on the heels are influenced by the magnificently painted and carved columns of Eastern palatial architecture. The flamboyant, structured heels in gold color, with embossed dragons and curly grass grain, are inspired by the elements of ancient Chinese gardens and the legs of classical Chinese furniture, combining architectural style with wearable beauty. Guo Pei creates an “East Palace” that is both a splendid imperial court of the East and a spiritual sanctuary of philosophy. 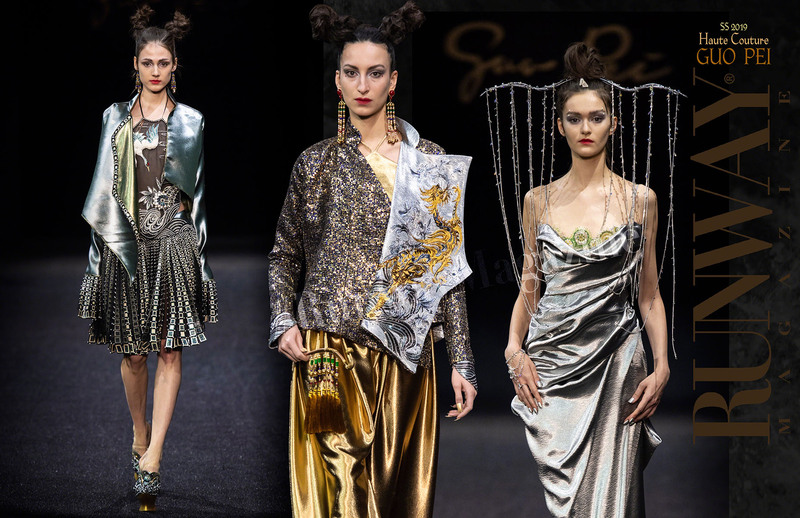 For Guo Pei, each couture show is a spiritual journey. It transcends fame, material rewards and acclaim. With this journey, she looks to transcend her own “self” and attain a state of contentment and perfection.